← Hiking Boots or Trail Shoes? What’s one of those items you keep forgetting to pack for a hike? Or, perhaps, you haven’t realized their versatility and don’t take them. I bet it might be sandals. Stream ahead. Not too deep, fordable, but the water will fill up your shoes or boots and drench your socks. So, you will go barefoot. But wait; isn’t that how you aggravated a blister or bloodied your foot on a rock the last time? Now, don’t you wish you had packed sandals? Crocs are my sandals. The ones you see in the pictures are the same ones I bought in Georgia in 2003 (back before they became a fashion statement) in a hiking store on the A.T. And I still wear them—around the house and on hikes. They are indestructible. 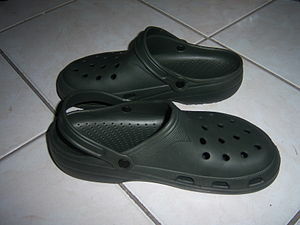 I submit, and I’ll probably be corrected, that crocs were first sold in outdoor stores. That’s where I and many other hikers first saw them. Sandals have other advantages. They provide the perfect way to air out your feet at the end of the day. And you won’t stub your toe walking about camp. In the black of night, if you have to void, sandals are quick and convenient as you exit your tent or shelter, and you don’t have to worry about stepping on sharp stones and twigs. Most of all, sandals are relaxing. Put them on your pack list, and end the day in comfort. On my last post, Paulo commented on trail shoes and inserted an excellent video that shows a unique way to lace low-cut shoes to give better ankle support. Thanks, Paulo. This entry was tagged backpacking, camping, footwear, hiking, long-distance hiking, sandals, thru-hiking, water crossings. Bookmark the permalink. Nice! I just received some Columbia Powerdrains and I’m thinking about using them or a spare. super light and water drains right out the sole. Yes, I love the drain feature, especially when you do extensive water crossings. Good stuff. Now I know how to lace my shoes! Yes, we can teach an old dog new tricks.